Put a definite article in front of Clairvoyants and you have one of the most respected Iron Maiden tribute bands in the European theater. Word To The Wise is Clairvoyants attempt to come out from that shadow and perform their own material. The result is the fulfillment of the old adage, 'Imitation is the best form of flattery.' Fans of Maiden and all things NWOBHM will find the disc a pleasing rendition of that classic genre with a mighty nod to one of it's greats. In other words, Clairvoyants is still paying tribute; they're just doing it with their own songs in their own style and doing it very well. You need not fear: Clairvoyants will not supplant Iron Maiden's role in heavy metal's past and present history. However, they are very very good and I hear echoes of Maiden in their music. Where it would be easy to steal riffs or melodies, Clairvoyants's compositions are quite original and effective. 'Choose Of The Truth,' Journey Through The Stars,' 'The Pain Of Sight' and 'Back To My Dreams' are highly competent and satisfying pieces of classic melodic heavy metal. Clairvoyants expertly delivers the twin guitar attack throughout. Even though it's natural to make comparisons, I don't hear Dickinson in Gab Bernasconi's vocals; I hear his range and passion, but I don't think Bernasconi sounds like Bruce at all. Actually, I feel he sounds better than Bruce on their cover 'Hallowed Be Thy Name.' (I wonder if yells 'Scream for me ...' at their IM shows.) Bernasconi establishes himself on the title track, 'Word To The Wise,' as does the rest of the band. This song displays Clairvoyants's mastery of their genre and their impressive technical skills. 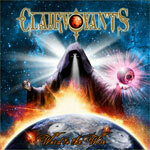 Clairvoyants's Word To The Wise is a noble and impressive work of melodic heavy metal in the grand NWOBHM style. Sure, their foundation is in their Iron Maiden tribute work. Yet, this platter contains well crafted and highly entertaining original material which will not have you immediately saying, 'They just sound like Maiden.' In the end, this would be real success. Very recommended.